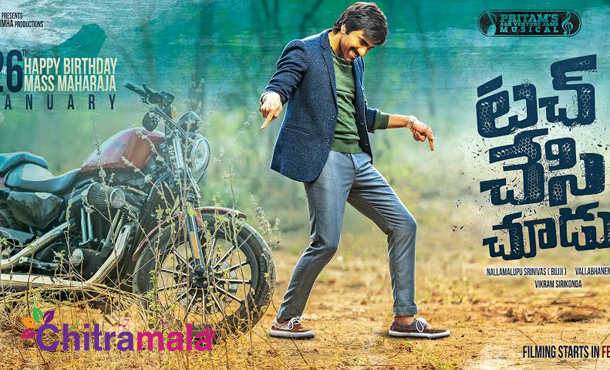 Mass Maharaj Ravi Teja is going to celebrate his birthday tomorrow and in this occasion, the actor has announced two new projects. While the first one is in the direction of Anil Ravipudi which is going to be produced by Dil Raju. The project will go on to the floors in March. On the other side, the second project will be directed by newcomer Vikram Srikanda and Nallamalupu Bujji will produce it. The makers have revealed the first look poster and motion poster of the film today. Apparently, the movie is titled as Touch Chesi Chudu. This project will go on floors first than the other one. The regular shoot of the film is going to bring in February month. Pritam is making his Telugu debut with the film as music director. According to the buzz, both the films are expected to hit the screens this year itself.